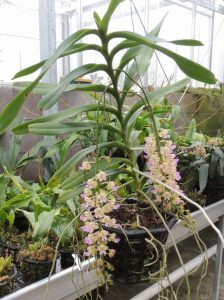 Our Aerides odorata is just coming to the end of its flowering and its place is being taken by plants of Aerides houlettiana. 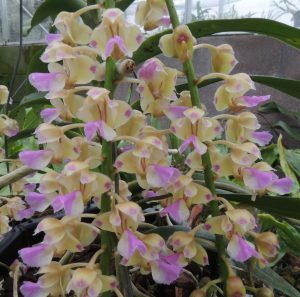 Aerides houlletiana is a medium sized species native to South East Asia where it grows in warm lowland forest up to around 1000m. We saw the species in the forests around the edge of the Bolevan Plateau in Southern Laos in open forest where it experience a warm wet summer followed by a cooler winter and a hot dry spring. We collected seed from a plant hanging in a restaurant near Tadd Fann waterfall in 2008 and the plant shown is one of the seedlings from this batch. The startling flowers are probably butterfly pollinated and left to its own devices the plant is semi pendulous with the very pendulous flower spikes hanging below the growths to allow easy pollinator access. The flowers are fragrant as well as beautiful.